Art Journaling 101 – Why Art Journal? I believe that art journaling is the number one way to set your creative spirit free and (re)connect with your Soul. It allows you to express yourself and experiment with your creativity in a personal, safe environment where no rules exist. Once you get past the initial fear of the blank page staring back at you (yes, I will be covering that in a later lesson!) 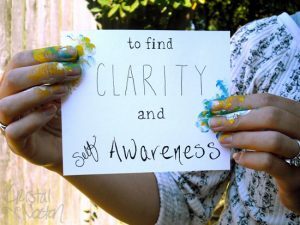 you’ll be able to spill open and create with such freedom that it allows you to find the clarity and self awareness you didn’t even know you were searching for. It helps you to exercise your creative muscles without fear of ruining a canvas or other expensive mediums you may work with. Art journaling allows you to experiment with your creativity in a way that never inhibits you. It gives you permission to play and make mistakes. It is such an inexpensive, quick activity that it becomes the perfect tool for keeping your creativity flowing. And as I’ve said before, art journaling for me is like a meditative practice; as I’m sure it is for many others as well. I get lost in it, completely engrossed in it. In a way, journaling makes time stand still. It stops your “monkey mind” and forces you to focus on what you’re doing. It’s an amazing experience to get lost in. Over the years, art journaling has become more and more an important part of my life. I have found it to be the only dedicated ME time that I can muster up, and it has become essential to my happiness in this busy bustling life! Why do you art journal (or want to)? Please share it with us in the comments. My video was inspired by Junelle’s “Why Art Journal?” video. This “Creative Journaling” video is also amazingly inspiring! I never really art journaled before. I think it’s time I start! I have always drawn and written, ever since I was a little girl. For many years I have been reading art books, flipped back and forth through books at the library. Dreamed to be able to get the pictures that I have inside me out on a paper. The Internet opened a larger “bank” of information and knowledge. And finally I found out to what is called Art Journals. For me, an Art Journal also become the meditative moment where I melt all that I have taken in with my senses and also upload my batteries: I feel elated after having drawn / painted and written a while in my Art Journal. Oh my, oh my! I’m doing it right as I’m reading this post! I mean, I stop, read a few lines, get back to my journal! Wowwwm, one of my many! I’m jurnaling ever since I was 14, so that’s a long time. Of course, I was jornaling most of the time, but not art journaling, more like a mixed media journal without acrylics or any paints at all: just my words and some photos from mags or maybe my photos,,,,but recently I just rediscovered how beautiful is to lose and loose yourself into art! I just enter Pinterest every day and I love to get inspired by so many art journals out there! Some are not so perfect, like I believe mine it isn’t, but some are out-gorgeous beautiful! ;) I never get bored of creating and drawing things….even if they are not perfect! They don’t have to be, I’ve realized they don’t have to….such a release! I’m going back to journaling stuff….stuff I have in my head, stuff I see every day, etc. YOU keep blogging, I try to post as often as possible, but sometimes I only have time to journal, and so little for posting and writing about the process. Life is full of judgement, from how good dinner was, how you look, how you parent, how much money you have……my art journal is the one place that there is no judgement. I am free in that one special place. Free to be just me. to write how grateful I am for things happening in my life. money, when one day I will leave this planet. I’m not an artist, nor have the patience to be a writer. But there are thoughts I want to capture and be creative about it. I believe art journaling offers me that opportunity. I art journal, because work is getting dysfunctional and demanding due to Epic computer training, extra hours are taking away my support group time, art journaling in a take along box enables me to do it where ever I find 10 free min to help me keep my sanity, because in this season of my life, I happen to work with a lot of dysfunctional women who are not aware of it, at least I know mine, and I don’t want to add mine to theirs….art journaling keeps me sane and happy in a work world of lost unhappy nasty people. For me . . . art journaling makes me feel like a kid again . . . FREE and without all the responsibilities of adulthood . . . it is an absolute pleasure . . . playtime all over again. I find it very absorbing and completely surprising. I never have a fixed idea of how the page will turn out and each page is so different. I am LOVING this adventure. I agree our art journals is a safe place for all the reason you have mentioned, which in this world, is hard to get any other way. My art journal has allowed me to deeply touch places in my soul I never had access to. Thanks for your wonderful Art Journaling 101, it’s great! Thanks for your Art Journaling 101, it’s fabulous! My art journal has allowed me to deeply touch places in my soul that I never had access to. Art Journaling is everything you said and more! I see Art Journaling as a natural, creative, artistic extension of my over-fifteen-year Artist Way practice (Julia Cameron) and my use of the intuitive process in my painting, drawing and Zentangle art. It is a safe place to explore feelings, try out materials and express in symbolic ways what cannot be expressed as well in words. Also, it is just FUN!!!!!!! I art journal because it has been almost therapeutic to me. I do it because its a way to express my emotions in a free, safe and positive way. When I journal I can let go, create and imagine with no one to hold me back, becuase I can proudly call my work my own. Not only is it a form of expression its a coping mechanism for me when I get stressed and speding time each day on it has literally pulled me through a lot of tough situations. I think this is the first time I am consious about what art jornaling is and I love it. I usually have ideas which I can’t work on inmediately so I know my journals will store well my ideas. That video sums it up completely. I am starting this year and trying and I need to do it, to journal it. I LOVE THE VIDEO!!!! Love it!!! Thank you! I have been doing so form or creativity for year but never an Art Journal!! I am now about to start one, thanks to you. You have made it less frightening and given me permission to not paint pretty pictures. lol This was inspiring and I am signed up for the Art Journal 101. Thanks again for your wonderful words as well as your art. God Bless you. Am a newbie but am loving combining all the artistic attempts which I’ve made over the past several years – none of them very good; am loving playing with new things like spray inks, etc. It’s just plain fun! I am still trembling a little at the prospect of art journaling. At 55, I am just discovering that there is an artist within me. I am hoping that art journaling will help me to discover her thumbprint. Would love it if you would tell us what the wonderful music track is that you have with this video and who the artist is. I know once I start I won’t be able to stop .. it is just starting. I love these tutorials and inspirations they are so helpful! I have been writing in journals …forever, I have always doodled on random pieces of paper, why in the world did it take 33 years to put the two together?! Its a wonderful eject button button for the mind. Sometimes you just need to get stuff out. I have just started journaling. I’m a retired high school art teacher and have been drawing and painting for over 60 years. I never realized how restricted my art was until I found art journaling. It’s hard, after all these years, to crawl out or my security … out of my comfort zone and realize there are no rules. Unfortunately I can no longer draw or paint because of a nervous disorder that causes my hands to shake, but I find that with a little patience I can journal around my disability. It’s like starting my creative juices flowing all over again in a new direction. It allows my mind to keep creating. Thanks, and everyone, keep creating. I’ve never art journaled before. I’ve wanted to for long long time. A while back I bought a little watercolour Moleskine notebook. Now I’ve actually done a few pages in it. Nothing fancy, but hey I’ve never done this before. I get inspired by what I see around the internet – and then make it my own. I don’t have a lot of supplies, but a few watercolours, gel-pens is in my position. I come to realize that I don’t need a lot of stuff to create something; use what you have, and that is enough. I really enjoyed this last video about why art journal, something in it really struck me. My answer is I have no idea. It is something I googled on a whim. I have fallen away from my crafty lifestyle and have been missing (!) painting. I have such a full lifestyle I have a hard time fitting in things. I think I am attracted to attempting to start art journaling to see if I really want to get back into painting and crafts again, and at the same time help curb my appetite for creativity. I appreciate your series and am looking forward to seeing where this leads me. Thank you. I want to try to start expressing myself more, in ways that are new and different to me…exciting ways. Hi! I’ve started my art journal 4 days ago :-) I have always loved writing and drawing, but in the past four years I’ve noticed I usually take visual notes in my notebook or planners. So I’ve decided to start a journal where to record the beauty hidden in every day. That’s so great Adele! So many of us find it easier to express ourselves and remember things with visuals. I have always had the desire to produce creative things from sewing, to lettering, painting and drawing. However, my inner voice can be critical of my own work. I trace that to my desire for perfection and a mediocre grade on an art project in 5th grade! Seriously, I am 62 years old! I think it’s time to let that go! I used to be involved in scrapbooking but just recently discovered art journaling and mixed media. I am having so much fun experimenting and learning what I CAN do. Thank you and the many others who are so generous in sharing your love. It is such great therapy! I started art journalling in an old diary, I stumbled on a video about altered books and that led to art journalling. I am very interested in the aspect of art journalling as a healing process. I have read some of the articles on your blog and would love more information in that direction,could you point me in the right direction?? I started going to my daughter’s at class with her this past year because I missed art so much. I didn’t realize it at the time but I believe it was to cope with my father dying a year ago. But I would wish I could do some at everyday but it would take a lot of time and mess. Then I discovered Art Journaling and started 2 months ago and I love it. I bought a book about it that helped me get started but I wanted more information and more techniques not just copying someone else’s methods. So here I am. I want to Art Journal BECAUSE I have wanted to be an “artist” my whole life, but since I was not blessed longing and looking was all I had. Then I began hearing “anyone can do this–you don’t even have to know how to draw. You can learn to draw or not. No rules, no mistakes just have fun PLAY. So here I am, just had my 73rd birthday a few days ago and am so excited to begin this new journey in my life. Even got myself an old denim shirt for my smock. I am a crafter, doing knitting, crochet work, sewing etc, but my favourite craft is working with paper. I haven;t had any formal art lessons but I took up tangling about 18 months ago. I like it very much but I find the pure Zentangle very restricting. I often look at the “strings” (or templates) and see things there that simply don’t fit within the Zentangle rules. So, I had to quit the groups because what I was doing didn’t fit . So, I have set myself a challenge this year to create an art journal, using my completed tangles and creating other projects to place within my journal. I have also decided to do a memory page for each member of my family within my journal, combining commentary, photos etc, fancy initials, that I can leave to my family onr day. I just needed to take my skills to another level. As you say, I am putting my heart on the pages, not worrying about criticism of my skills or anything else, because it is so personal. Thanks for your guidance in my endeavours. Why do I want to art journal? Because I want to have something beautiful and have no money to pay for other peoples art work. I’ve been dabbling in the world of art journals for a while, feeling my way through, but decided I can always try learning something about them from people who know more than me. I want to start art journaling to keep my mind of my chronic pains and to open my creative juices again. Hello- I have done written journaling, and some art projects, including zentangle. However these were separate. I am interested to see how to combine art and writing. I am a little worried that the words will get lost because the pictures are so beautiful. I will see how it goes. Thanks for providing this opportunity to learn more about art journals. I have always admired anyone who could paint. My husband and all my 4 sons paint, my sisters-in-law, actually all the family around me paint. They are having a family exhibition in September. I started to feel left out, then I discovered Art Journalling and the fact that I don’t have to be perfect struck a chord with me. I am working on my perfection and starting to enjoy it. I love looking at other journallers work which I find very inspirational. I try to do some every day and as full time carer for my husband it gives me the time that I need to myself to give a bit of pleasure in my life. Thank you for sharing your talents it has done me so much good. I’ve always written, poetry and short stories mostly. Even though written word has always been my main vehicle I discovered drawing and painting a few years ago. It was like the world had opened wide and I could pour out my heart and soul in ways that I never could before. I just started m first art journal and I love it! There’s no pressure, no thought to what someone else will think. I can just… be. That’s why I love art journaling. I wish to be more creative. I have always loved art and especially mixed media, and I would love to incorporate mixed media into my art journal. I also have depression, and I think an art journal would be a terrific way to handle some more… difficult situations and emotions. I’ve been a life long journal keeper, but I’m wanting more visuality in my life to express everything. I’m trying to also overcome my fear of the blank page as well as my own artistic abilities. I’m looking forward to this class. I have done a little journaling in the past but would like to be more committed to doing it and learning new techniques. My Wreckie is finished now, it is time to start a new project. And I prefer a project to find myself again after 10 very heavy years. We’ll see what art journaling will bring me. Why art journal? I want to improve my design ability by playing with paper, and colour in it’s many forms, whether it be paint, crayon, texta, or ink. I want to be comfortable with lines and a paint brush. I am so used to using fabric & thread, paint and paper are uncomfortable. I hope to change that. Because art journalling dismantles what is falsely put together and re-unites seemingly broken. Because it makes me see what is invisible and make deeper connection with the simple and the ordinary. It grounds my gratitude, it inspires paradoxical and complex insights which yield simple yet powerful answers. It has kept me relatively sane and made me appreciate my bouts of inspired insanity. It answers my soul’s call. It is my life. I’ve always loved Writing and been able to express myself better that way. .I’m exited to start art journaling . I’ve been interested by art for awhile and my reason is … to find myself. To be unashamadly me. To not b afraid to fail . To create without fear. To de-stress.To play with no rules or limits. I feel there’s a whole world out there I don’t no. I’m exited about getting these videos everyday! Thanks for doin them for ppl like me. I have been diagnosed with PSD, anxiety and depression :( I have lost interest in life , people , doing things. Nothing helped until my son asked me to help him to make Thank you card for his favourite tutor at home. O Wow, I notice light at the end of very dark tunnel. I make cards and its makes me so happy. I want to learn to make art journal so that I can express my life , my worries, happiness and sadness through art. In my vision, one page of each event in my life would be a ”Book of my life” in my word/way. I want to learn basics and more to enjoy life again…. I started art journaling in February 2015. I need to get back to it so I can find myself,enhance my spirituality and most of all have some fun in my life.I was comparing my art to others and it stopped me from creating. To find my calling in this life….. I want to fight depression for good. I want to make positive changes in my life. And I love me time. Hi Gabriela! 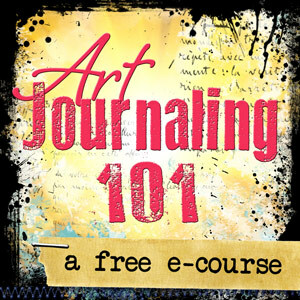 If you’re following along with the free class Art Journaling 101, you’ll get some ideas on where to start. But my more in-depth course – Creative Soul Roots will guide you into listening within and discovering your own way to express yourself in your journal. I’d love to start art journaling as a way to myself. I’ve never draw or smth like this.. I’ve never thought I can… but now I feel that l need to start! To try! I need bring something of myself outside! I just can across your name from a post of Brene Brown’s. I’m so inspired! I’ve been looking for a way to recapture my artistic self for too long! I know she’s in there!! I have had that “where do you start? ?” Or “I don’t know what to draw or paint?” attitude for too long. I need to start somewhere and journaling seems like the place to do that! Thank you for being out here to inspire! I have a major depressive illness and my psychologist has been encouraging me to return to journaling as a part of my therapy with her and I have been resisting it, but the concept of art journaling takes just writing to a new and more creative level that appeals to me on many levels so I am keen to try this. It will, I hope, take me out of the dark depressive spirals I so often find myself falling into and increasingly find it more difficult to climb out of, so with my beautiful therapists help, I am hoping that this may be the key I have been searching for to finding the ME that I know is still there somewhere waiting to be found. Thankyou for this opportunity at a cost I can afford too! !It could just be a lifesaver!! 1. It looks visually stunning and exciting! 2. I’ve enjoyed artwork and I’ve enjoyed journalling in written form but have never tried art journalling and feel this would reveal an extra dimension to my creativity. 3. I’ve been reluctant to use paints as that’s not what I really want to do; art journalling will allow me the freedom to play without any rules. 4. I’m very curious as to just how I will get on and I’m confident the journey will be inspiring and fascinating! I have so many (artistic) ideas, this is a place to try them out. And its a journal of me, just expressed in art instead of words. Its my desires, memories, wishes, and plans. Its anything I want it to be on any given day. I’m coming out of a very difficult time in Ministry. Like compared to a war vet kind of hard. Art journaling mixed with altered book ideas are my main way of staying connected with the Bible as I find my feet again. A way to stay present yet go very gently. I’m looking forward to art journaling as a way to mindfully put my thoughts on paper without all the stress of getting the words just right. Hopefully it will be cathartic and healing for me. I’m also hoping to release the creativity I know is inside me, and would love to be able to use what I learn to help my junior high students rediscover their creativity, which has been “schooled” out of so many of them at this age. I just started art journaling and I love it! It is magic. I love gettting my thoughts and feelings on paper. It’s great having a secrect place to put my thoughts and feeling into that no one can see, analyze or criticize. I don’t consider myself artistic but I deep down I would love to be. I’m always put off by the process because my attempts don’t come out looking like the “perfect picture” I feel they should be. I now see that messy can also be beautiful. I’m learning that it’s more about getting out my emotions rather than the “perfect picture”. Now very excited to give art another go. Can’t wait to see what the Art Journal 101 course brings out in me. Thanks for the inspiration. I have wanted to make an art journal for more than a year now, but I am afraid of the blank page, an uninspired mind and mostly, I am afraid of my fear of failure. Art journaling is a way for me to find my creative side again, and to make something not “right” but just something. Something that might fulfill my need to make a book, safe for my sensitive mind. I want it to be like an inside look to my mind, especially for my self, since my mind can be somewhat of a maze sometimes. I used to spend hours writing in smoky, quiet cafes. It was my way of sorting out my emootions. Then, I came across some drawings from when I was a kid and started adding little drawings in the corner of a page now and then. I took a painting course with a friend and loved it! But I couldn’t figure out how to put them all on a page without making a mess…the perfect clean white page would stare me down every time. So please teach me how to freely mess up the white page…this is gonna be fun! I kept a journal (written) for many years, and especially when I was working through intense emotions. I’m also a secret artist — I love to play with color, but can’t draw a dog that looks like a dog or a tree that looks like a tree. When I heard about art journaling, it seems as if it might be a way for me to marry these two, but I have no idea where to start. I searched the Internet to see what is out there, and your blog caught my eye. So here I am, ready to begin Art Journaling 101 and free my inner artist. I’ve seen at times people journal but couldn’t see how writing by hand in a copybook would help me when I can’t understand my own handwriting. I admired one friend’s drawings though. I started last year making collages and dabbling in abstract painting but I don’t seem to finish them or want to submit them to exhibitions. I have no issues with photos since I can print more but a painting or a collage are one and I can’t figure out how to part with them. I don’t know why I wanted to join you. I would like to be part of a daily effort. 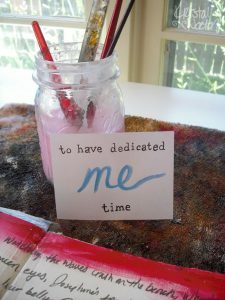 I would like to art journal to spew out the words, feeling, and sentiments that I think are buried under …….. I have been a journal keeper most of my life and my mother had an artistic eye. I want that freeing feeling of creating something unique to me. At 50 years old, it’s time. Do you have a list of prompts we can use? I am wanting to use this as a group at work with survivors of sexual assault and domestic violence, and would like to be able to give them a different prompt every time we meet. I started my first art journal 2 years ago, but in the last months, I stopped working on. I’d like to challenge myself to restart making art journaling and I’d like to start an art journal with a group of talented school kids. Thanks for the free lessons I’m sure I’ll find new inspiration and desire to restart art journaling again. I have recently done some paint nights with friends and I love mixing colors. I have been a pretty dedicated mom for the last 20 years and am a year away from being an empty nester when my youngest goes to college. This is a crazy emotional time and I think art journaling will help me feel those feelings and move through them. I am excited about the future and finding out who I am when I am not parenting 24/7. I took art classes most of my childhood and enjoyed art until I had an art teacher in my junior year of high school tell me I was no good. I walked away from art then. I look forward to creating without the perfectionism that drove my youth. I want to journal my life lessons, I want to journal my fears and hopes and I want to discover who this menopausal woman is. I am so excited to be part of this journaling adventure. I have doing some with my daughter (46 ears old) and we are having so much fun. I love what you do and it will bring another way of expression to our journey. thank you for sharing. I can’t wait to get home and start! I have never art journaled and I always thought it was sort of a waste. Waste of time and products. But I am seeing value in it. I also teach art to a young student (6yrs old) and I see she is sort of all over the place in her art and in school. kind of ADD. So this can be a really helpful tool to get her to focus with her art and it may spill over into her life. In quieting my inner spirit to learn to put my thoughts and dreams on paper in art, I can then help her with hers. If this is a helpful tool then it becomes priceless. Its never too late to change the way you journey through your life, set goals, remember, give you hope and healing. Art journaling as a tool for personal growth, personal exploration, and creativity. As a student of counseling, I am required to do at least 50 hours for personal growth and self-care. I am looking for a practice that will stick with me as much as I stick to it. I want to art journal because I love to create. And like you said, it’s a way to work through and express things that can’t easily be put into words. I did a 30 art journaling class during a stressful period, and it was rather helpful. Some of the stress has gone, but I still want to express myself. To give myself permission to try things out without worrying if it looks ok or not. A place to express how I feel, good days as well as bad. To exercise the creative side of my brain. A place to try out the craft things I had to have and then didn’t use! To enjoy! I have been trying in fits and starts for several months now but not really getting going. I think I have got to the stage where I know what I want to say. Having had an odd sort of life that entailed much travelling. I need to talk about it even if no one wants to read or listen to it. I art journal because with paper, color, texture I can express thoughts that don’t always have words! Creativity is good for the soul. And that’s what I need! I started out with digiscrapping and stumbled across some art journaling inspiration. My digiscrapping quickly turned into art journaling and my quiet stress release time. Now I just want to get even more creative. I love seeing a white piece of paper give birth to something brand new.